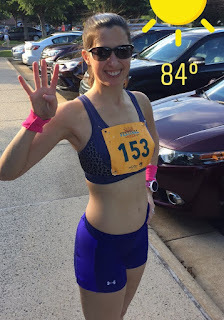 Last night I ran the =PR= Twilight Festival Four Miler. This was my 5th time running this race, I had run it before in 2007 (31:18), 2008 (time unknown), 2015 (30:08), and 2016 (28:36). 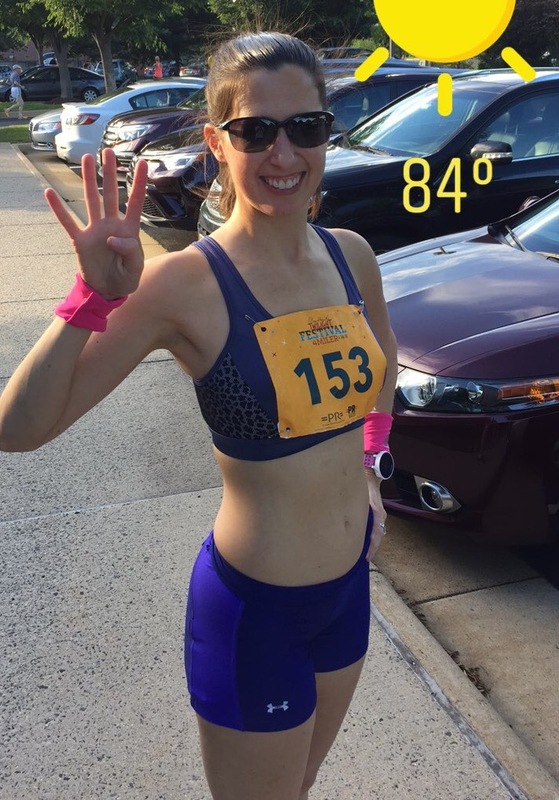 This race is known for being very hot, and I like it because it's a good mental challenge. pace! I also had a mixed workout of a 2-mile tempo run followed by 4 x 400m, 4 x 200m. That was good practice in shifting gears. Going into this four-mile race, my "A" goal was to run the lower half of the 27's, so sub-27:30. My "B" goal was simply to break 28:00, because I had never done that on this course before. This year, the temperature was 81 degrees with a sunny sky. Last year, it was 91 degrees, which was suffocating. Given that I ran the Mother's Day Four miler in 26:57 not too long ago, these might seem like easy goals. But the Mother's Day race has much cooler weather (30 degrees cooler). I'm not a huge fan of nighttime races, but I do them occasionally because it's a different challenge. I wasn't really sure what to do with myself on Saturday, or how to eat. I hydrated A LOT, alternating between water, and water mixed with UCAN Hydrate. And for some reason, I found myself really hungry all day long. My plan was to have a bagel with peanut butter two hours before the race, which started at 7:30. But at 4:00, I felt like I couldn't wait until 5:30, so I just ate early. different address from the email, so I had no idea where to go! I texted my friend Rochelle, who was already there and she confirmed that the race hadn't moved. Then I realized that the address from the email confirmation was the location of packet pickup. Ugh. And the course had not changed. The term "new course" language must have referred to several years ago when they changed it. that part of the course would be shaded. Of course we were sweating like crazy after the warmup and I was dying for water. I can't believe how much water I drank on Friday and Saturday but still was thirsty immediately before the race. And I didn't even have to use the bathroom. I did some strides and then lined up at the starting line. I knew that this would be a competitive field, and I wasn't going to be among the top five women like I had been for my previous four races, but I was hopeful about placing in my age group. 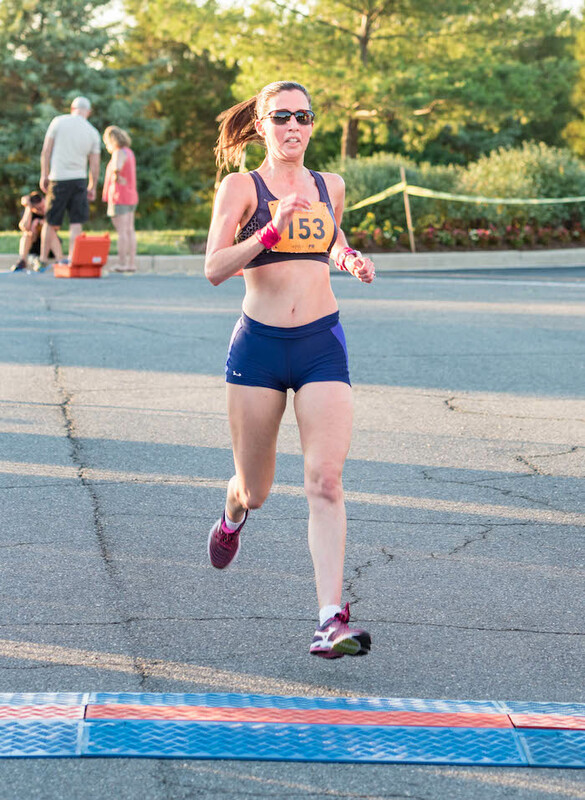 From having run this race the past two years, I knew that the best approach was not to go out too fast during the first mile because you don't feel the effects of the heat until later in the race. According to last year's blog post, my start pace felt like marathon pace, which then started to feel like 10K pace in the second mile, but race pace for the last two miles. So my plan was to run the first mile in 6:45, then 6:55 for the second mile (uphill), and then as hard as possible for the last two miles. easy. I knew I was running faster than planned but it felt good and I didn't want to limit myself so I just went with it. Even though I typically have a very precise race plan, I often toss that out the window if things feel different than expected. Unless, of course, it's a marathon when you can't really know at mile 2 how it will feel at mile 22. So, I ended up running a 6:35 mile. Okay, time in the bank! This is the only net uphill mile of the race. All the other miles are a net down. So I told myself to just get up the hill, just get through the mile and everything would be fine. Now, relatively speaking, this hill isn't terribly steep. I think it was like a 30 foot gain or something, but with the heat it just always feels much steeper than that. The Mother's Day 4-miler starts out with like an 80 foot climb or something crazy. But yet this second mile with its modest ascent felt tougher than that. It was during this mile that I did most of my passing. I picked off about three women, and by the time the mile was over, there were only two women left in my sights who I wanted to pass. I also grabbed a cup of water from a water station and poured it over my head. It felt good, but the sun was still beating down on me. My split for this mile was 6:58. A little slower than I wanted, but maybe that meant I would have more energy for the end. survive this agony for another mile. Last year I really sped up during this mile. It was my fastest mile of the race, so part of me was just waiting for that magic to happen. But last year, I went out more conservatively so I had the energy to push. This time, it wasn't until about halfway through the mile when things turned around and it started to feel less like a death march and more like the 4th mile of a 4-mile race. I really rallied and told myself to just hang in there for a few more minutes. I could do anything for a few minutes. I didn't pass anyone and no one passed me. I was focused on getting to the finish line in a respectable time, thinking that my goal time was probably way out of reach. My Garmin beeped for a 6:38 split, and I caught a glimpse of the total time at 27:00. But I knew to expect from the past two years that my Garmin would measure this as a long course so I just kept gunning at a pace of 5:56 until I reached the finish line. Thank God that was over!!! exchanged war stories of how hard the race was. We then proceeded to the results table, where I learned that my official time was 27:32, and 7th overall female. I placed second in my age group. I was really happy with this placement, considering how competitive the field was. I never was able to catch that one woman, who finished about 8 seconds ahead of me, but I was fine with that, seeing as I went into survival mode for about a full mile. Greg placed third in his age group in a blazing 26:30. We cooled down for about a mile and then I went in search of the ice cream truck. I was disappointed when it wasn't there, as that's one of the best things about this race. After getting our awards, we went to a local brewery with Lisa, her husbands and some other runners. This morning, I had a medium-long run scheduled. I took it nice and easy and it took about 7 miles of running to work out all the kinks. I ended up with 11.6 miles at an average pace of 8:56. Afterwards, I showered and went back to sleep! I got a massage later in the day. I ended up with 46.4 miles for the week, which is about what I have been doing for the past month. I am a numbers junkie, so I couldn't resist performing this analysis of four 4-mile races. Year over year, I improved my Mother's Day time by 54 seconds, and my Twilight time by 64 seconds. 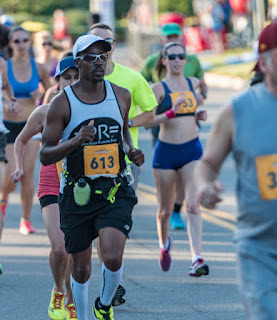 However, the weather for this year's Twilight race was 10 degrees cooler than last year, so if it were hotter, I might have only improved by 54 seconds. In 2016, my Twilight time was 45 seconds slower than my Mother's Day time. In 2017, my Twilight time was 35 seconds slower than my Mother's Day time. My Garmin measured 4.01 miles for the Mother's Day race in 2016 and 2017. My Garmin measured 4.09 for both Twilight races. In Garmin Land, my average pace for both races this year was the same at 6:44/mile. 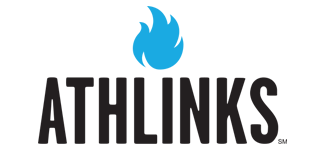 Next up is a 5K on July 4th! After that I will take a little break and then start training for my fall marathon. Nice job! You are fast, my friend! 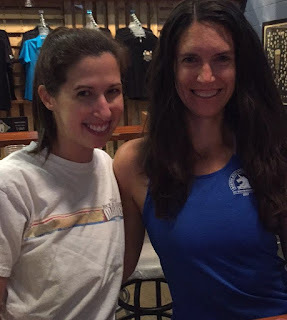 Kind of funny, in last week's recap, I wrote about a hot, humid 4 mile training run. As I said, "who knew running 4 miles could be so hard?" Congratulations on another race! 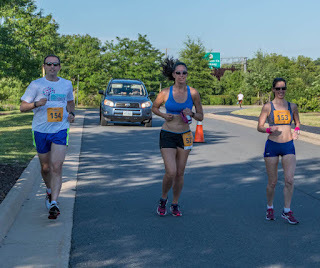 I thought you did a really awesome job, especially since you had the same pace as Mother's Day even though I am sure this one was way tougher with the heat and humidity. I feel like as long as I don't get "much slower" in the summer, training is paying off ;). Congrats on a great race! It is so fun to do the same races year after year so that you can geek out on the stats! Congrats on another great race and for placing in your age group! There is only one 4 mile race I do every year on July 4th and I am looking forward to it. It isn't a flat course like I am used to but I like the distance. Congrats "Zebra-runner" on a very respectable performance and once again an-oh-so-detailed mile-by-mile recap! You certainly love the number-crunching....and that's what I like bout you...as well as your "tenacity" to run the extreme end of one's individual performance abilities. 81F or 84F (as picture denotes) is not cool temps by any means and we know your history and difficulties running in the heat! So you did well in that respect and that's something to hang your hat on. The woman you cite that you couldn't catch up with and finished 8-sec ahead of you....have to suspect she recognized you were closing in and you were probably the motivation for her to hold-on and just stay ahead of you! But in another respect you may have had an "imaginary rope" lassoed to her and she pull you in to the FT you posted. 27:32 is quite awesome and respectable FT for mortals to run....and it's sub-7 high-6 min mile pace. That's a good place to be! I like your reference to "Garminland" and the 6:44 pace. But again....that means nothing in the world of running and racing and what goes down in the books....the official FT. But you ran very good race there...especially with the first mile so fast. You recovered and tapered back a bit to sustain the overall drive to finish out 4th mile strong. That's what really counts....running your race....to your terms...and be happy with the FT you end up with. "Time flies like arrows and fruit flies like bannanas!" Of course that latter quote is a "biological-centered" pun...has nothing to do with running...or does it? Cheers! Well done on another super fast and well run race! You are such an inspiration. You're training is going so well, as evident from your racing! And you look great in your pics - so calm and on the ball. Love the cold towel idea as well.